This is a (very) brief overview of the Clan MacNicol of Scorrybreac, officially known as The Highland Clan MacNeacail. 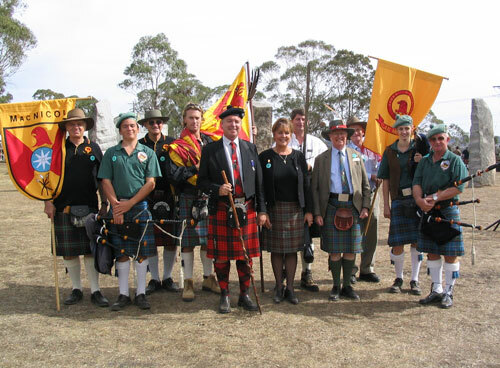 The present Chief is John MacNeacail of MacNeacail and Scorrybreac, son of the late Iain MacNeacail. The Chief lives in Ballina, NSW, Australia. Members of the clan have a variety of surnames, including Nicolson, MacNicol, MacNeacail, Nicol and Nicoll. They are connected with their common Chief, and with their connection to the lands of Scorrybreac, overlooking Portree, on the Isle of Skye, Scotland. The motto on the top of the Clan crest reads "Scorrybreac", referring to the Chief's ancestral lands. The motto beneath the crest reads "Meminisse sed providere", meaning "Remember but look ahead". The Nicolsons are believed to be of Norse descent, with the first 'Nicol' thought to have been a descendant of a Norse High King. He possibly arrived in Skye in the thirteenth century. (Skye was part of the Norse lands until 1266). The Nicolsons seem to have flourished around the fourteenth century, with MacNicol spearmen playing a crucial role in supporting Edward Bruce in the 1316 siege of Carrickfergus Castle (in Ireland). These spearmen feature in the MacNeacail Coat of Arms. It is thought that the MacNicols originally owned much of the Isle of Lewis, but that these lands, and much of the Clan's prestige, passed through the marriage of a MacNicol heiress to the MacLeods of Lewis. By the mid-seventeenth century, the Chief of the Clan was the Reverend Donald Nicolson, who it is thought was responsible for the change from MacNicol to Nicolson. He was a Chief of great repute, and seemingly, of good means. Although there were few links between the Nicolsons and the Jacobite uprisings of 1715 and 1745 - the consequences radically altered life in the Highlands of Scotland, with increasing poverty, the Highland Clearances, emigration, and the gradual breakdown of the traditional Clan system. In 1813, Donald Nicolson succeeded Malcolm Nicolson as Chief. However rising rents, bad weather, and falling livestock prices meant that he soon found himself in considerable debt. The result was that the lands of Scorrybreac were lost, and that Donald's sons all left Skye. By 1841, the new Chief, John Nicolson, was living in Tasmania. The first Chief to return to the lands at Scorrybreac was Norman Alexander Nicolson during leave from fighting in the First World War. He took a stone from the ruins of the old house, first to France and then back to Australia. This stone is now part of the cairn at Scorrybreac. In 1987 the Clan MacNeacail Trust, using funds donated by Nicolsons from around the world, purchased the Ben Chracaig estate on the former Scorrybreac lands (overlooking Portree) to preserve them for public enjoyment. Source (and for more information see this excellent 'official' history of the Clan): The Highland Clan MacNeacail (MacNicol): A History of the Nicolsons of Scorrybreac by W David H Sellar and Alasdair Maclean. If you are interested in purchasing this book, please contact us.